so it turns out the reason i couldn't post any photos was that i had reached my limit for my blogger account, which is 1000 photos! that really put it into perspective for me how much i've put into this here blog. pretty cool. i just love that i have this record of our lives and of my work, what a wonderful thing. anyway, i realized that i could go to my picasa web album and delete some to free up space here and that's what i did. so here are the first day of school pics. i almost never dress them in matching clothes. 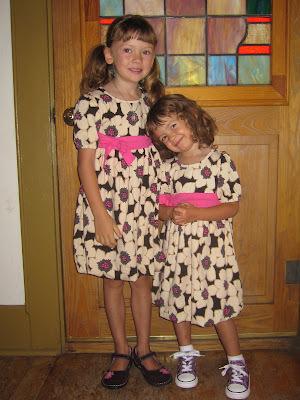 but patty and i took the girls back to school shopping in nearby farmington and when i saw these dresses i had to have them. i think some family portraits may be in order soon as well. please note junebug's choice of footwear. and how freakin' TALL hazel is! of course her blanket, "tinky", went with her. she's so proud of her little first grade self. and here is my new office! it is fabulous. the main framer, woody, told me today that they are almost finished framing! this is the view if i am standing right outside the door to my shop. that big space there will be french doors leading out of our bedroom. above that is a big window that you can't see because of the tree. next summer glenn will build us a beautiful flagstone patio outside those doors. it will be so fabulous! how's everybody doing? 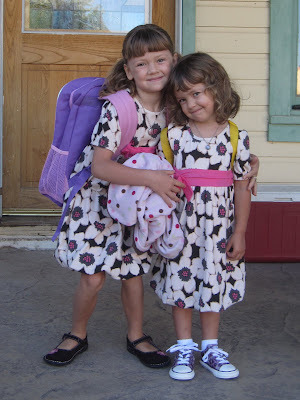 are your children back in school? what is the end of summer looking like for you? thanks, linda. they are such sweeties! and i cannot wait to see my new office either! there is a lot of space up there. i think i am going to put all of my casting equipment up there too! what sweeties, your wee girls! 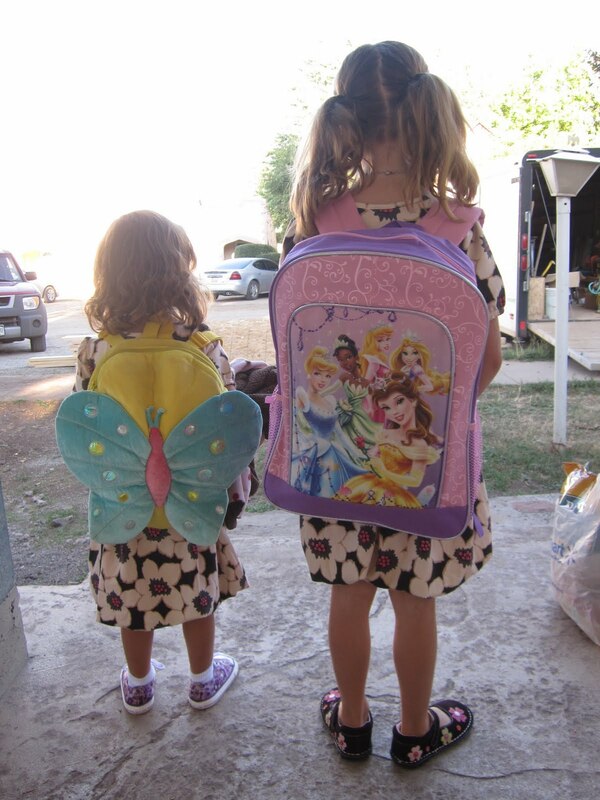 love their matching dresses and the awesome backpacks.